I love the pumpkin season! 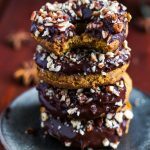 After my pumpkin pancakes I brought you some vegan pumpkin donuts! Ahh these turned out so fluffy! The recipe is obviously sugar-free and oil-free and it can also made easily gluten-free as well. 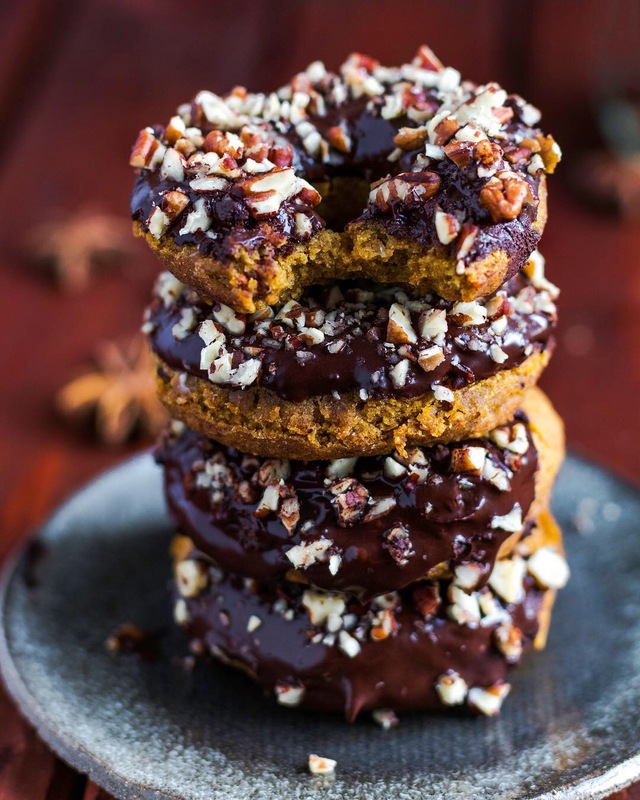 These baked donuts will definitely be different than the deep-fried ones but I´m not much of a fan of deep-frying nor oil. These are more like donut cakes but I wasn´t going to name them like that because to be honest they do look like donuts! ? Super fluffy and delicious donuts! Perfekt for Halloween! Prepare your donut form. I use a silicon donut form so I don’t use any oil. Put your cooked pumpkin, dates and milk in a food processor or blender and mix well. Mix your dry ingredients in a medium sized bowl. Pour your pumpkin-date mixture to your dry ingredients and mix well. Add the applesauce as well. Divide your dough in the donut form. Bake for about 13-15 minutes. They should be lightly browned. Mine has 6 holes so I had two rounds of baking. Serve with melted hot chocolate or with my home-made chocolate sauce. For the chocolate sauce just mix the cacao powder, date syrup and water. First add less water and gradually add more to reach the desired consistency! You can also add more syrup if you like it sweeter! I personally like the taste of the bitter chocolate. 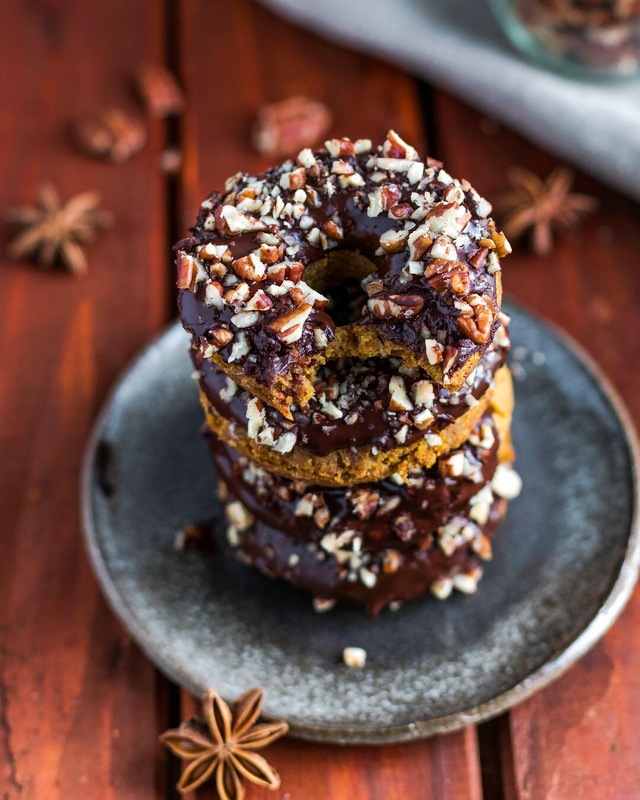 Dip the top of each donut in the chocolate sauce or melted chocolate and then immediately place onto a parchment lined baking tray and sprinkle some chopped pecan nuts on top. Keep them in the fridge, but best eaten straight away! I think that the chocolate frosting definitely make them even better but you can also try an other frosting. 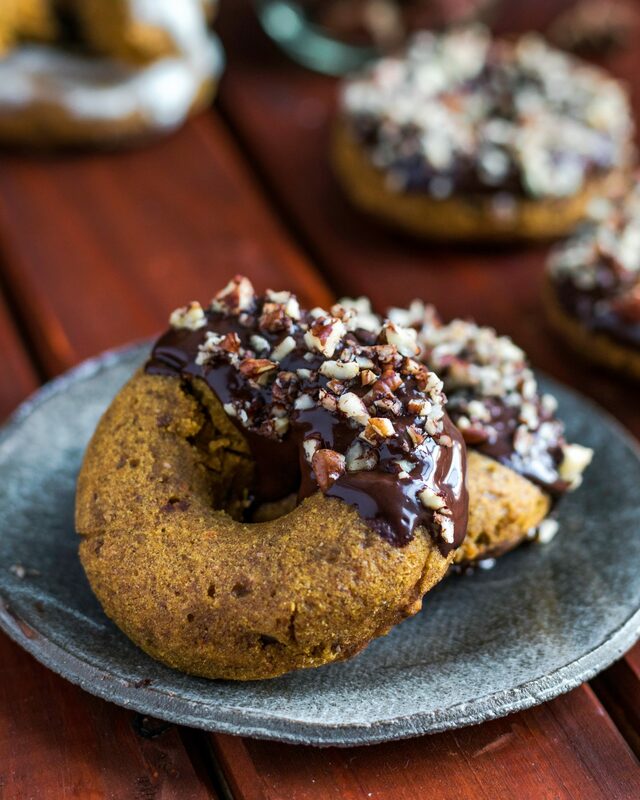 Alyssa´s pumpkin donuts also look amazing! Do you know her blog? Feel free to pin this photo, if you use Pinterest! Thank you! If you make my recipes and would like me to see them on Instagram, then please use my hashtag #yolcsitaeats or tag me in the caption! Thank you! ?